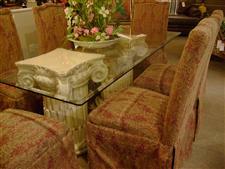 Affordable Consignment Furniture of PA presents: 2 Beautiful fully Upholstered Dining Chairs. They have a skrted bottom, nail heads and done in a tapestry fabric. Price is for each chair. Click thumbnails to view image.